MacBook Pro with Vega 20 GPU. The latest MacBook Pro retains the fourth major body redesign that the product line has seen. The new design leans heavily on fabrication techniques used for the Retina MacBook, MacBook Air, and iPad, with the design still 0.61 inches (15.5 mm) thick -- making it thinner than the MacBook Air. Apple's high end 15-inch MacBook Pro is still available in standard Silver and a darker Space Gray finish. As before, the Touch ID button is still a physical one, and it serves as an emergency way to force a shut down in the case of a nasty Kernel Panic, as well as for authentication after you've logged in. Other power functions are handled automatically by default, with the user opening and closing the lid to respectively wake or sleep the machine. The Touch Bar remains polarizing, is unchanged from previous models, and we aren't going to discuss it here. The whole point of the 2017 MacBook Pro refresh was the addition of Kaby Lake. The 2018 has taken that a bit farther with Coffee Lake, and DDR4 RAM in the 15-inch model. The November shipment of Vega 16 and 20 models takes that a bit further -- for a bit more money. For this review, we're examining the 2.9GHz 15-inch MacBook Pro with i9 processor, 512GB of flash storage, and 32GB of RAM. The retail price on this configuration with the Vega 20 is $3849. That keyboard. Once again, we've gone over this before, in our 13-inch MacBook Pro review, and the 15-inch i7 that was released at WWDC. Keyboard key travel is minimal on the MacBook Pro. It's still got that rubber gasket. It's still clackier than the 2015. It is still polarizing, depending on what you feel about key travel, and we still don't know if reliability is any better than the 2016 or improved 2017. But, on the subject of reliability -- while Apple has a repair program for the 2016 and 2017 model, there aren't an epidemic of failures spanning every user across the globe. We're not thrilled that it is less reliable than the 2015 keyboard, but it is not a wide-spread phenomenon. The Radeon Pro 555 and Radeon Pro 560 shipped in the 2017 model. The 2018 model used to have "X" versions of both, with slightly better performance and more video RAM. With the refresh in November, the 555X has been dumped in favor of the Radeon Pro 560X at a default, with user options for the Vega 16 and Vega 20 chipsets. There's been some confusion about the choice to use the Vega 20 name for one of the two options, as it is believed by enthusiast PC users that the Vega 20 will be the first GPU from the company using a 7-nanometer process. The desktop-class GPU is said to include between 16GB and 32GB of HBM2 and require between 150 Watts and 300 Watts to run, which can be generously described as undesirable for notebook usage. So, this is not that. Heat pipe positioning with a 560X GPU versus the new Vega 20 configuration. In any event, the Vega 16 and Vega 20 include support for second-generation high bandwidth memory (HBM2) that provides a few extra bonuses compared to the more conventional GDDR5 memory used in other graphics cards. As the name suggests, it offers considerably more memory bandwidth per chip compared to GDDR5, while at the same time consuming less power -- and it is on the GPU die, making for a simpler assembly to cool. As it has done so for a decade plus, macOS can automatically activate and switch to the dedicated GPU when necessary and fall back to integrated graphics to save energy. In these cases, the on-board graphics are a hair faster than the previous generation's integrated chipset, but nothing notable. This is unchanged from the previous model. We said that we'd tell you how we felt about it in a few months from a day-to-day use perspective, and the verdict is still out for us. We're activating it for general use, and turning it off for applications that require precise color -- which is perhaps what Apple intended in the first place. Get as much RAM as you can afford at purchase. Like we've said before, it's a worthwhile purchase if you're looking to keep the machine for four years or more. As with the summer update, Apple has shifted to DDR4 RAM to get the 32GB option, as it literally couldn't get there with LPDDR3 RAM. The inclusion is both faster than LPDDR3, and more power-hungry. And, it's also hotter, further complicating an already tight thermal situation. Starting with Geekbench 4's OpenCL Graphics test, the Vega 20 achieves a 37 percent better score than the 560X. Geekbench 4's Metal test showed a 23 percent improvement. One thing we noticed was that the Vega 20 graphics in the MacBook Pro ran cooler compared to the 560X thanks to improvements in efficiency. Now this can lead to some more benefits, but we'll talk about that more in a a bit. Now onto some more serious benchmarks: video editing in Final Cut Pro X. Starting with stabilizing a 20 second 4K clip in Final Cut Pro X, the MacBook Pro with Vega 20 only took 8 seconds compared to 13 on the 560X. Exporting a 5 minute 4K clip, Vega 20 took 3 minutes and 21 seconds compared to 3 minutes and 44 seconds on the 560X, which isn't too big of a difference. However, when we start using a more power-demanding format, like 4K RAW from the Canon C200, we see a much bigger difference. The Vega 20 exported a 5 minute 4K C200 RAW clip in 13 minutes and 54 seconds compared to 18 minutes and 30 seconds. The real difference is in how well each MacBook plays back the footage while editing. Vega 20 was able to play back the 4K C200 Graded RAW footage at 31 frames per second compared to only 20 on the 560X. With the Vega 20, you get perfectly smooth playback, even if you shot your footage at 30 frames per second. That's only a few FPS behind the Blackmagic RX 580 eGPU connected to the 15-inch MacBook Pro. But, there are some efficiencies in the Vega 20 that we didn't see in the Radeon Pro 560X. During our testing, the CPU speed in the Vega 20 model exceeded the baseline speed under load by a higher margin than the 560X in the same 20C office that we ran the testing in the first place. In our Red RAW export, which pushes the CPU and GPU to its limits, the i9 processor ran at a steady 2.9GHz compared to only 2.4GHz in our previous testing with the 560X graphics. We also tested Cinebench R15's CPU test to take the graphics completely out of the equation, and the i9 processor scored 57 points higher with Vega 20 graphics compared to 560X graphics, so Apple definitely improved something -- but we're just not sure what it is. So as far as video editing goes, Vega 20 is more than a worthwhile upgrade for the extra performance you get. USB-C is not the end of the world, but it is an adjustment for users. That adjustment is better actually made, than struggled with using half-baked solutions. USB-C-to-whatever connectors are cheap, and plentiful. Complain all you like, but the Thunderbolt 3 with the USB-C connector is a universal port for video, power, and data, is far faster than USB 3.0, and is a game-changer for use cases, if you let it help you and fight it less. MacBook Pro Thunderbolt 3 ports. A solution that may keep adapter costs down if you're hell-bent on not recabling peripherals is a Thunderbolt dock. While Thunderbolt 3 docks start at $199 retail, the $49 Apple Thunderbolt 2 to Thunderbolt 3 adapter will work nicely if you want to use an older dock with the newer gear, possibly making the prospect of a Thunderbolt 2 (or even original Thunderbolt) dock cheaper than a bag full of adapters. If you liked the MacBook Pro's power to price ratio, the Vega options add a decent performance package for the money. If you weren't happy about the price as compared to Windows machines, this won't help one bit. Editing video on the MacBook Pro with Vega 20 is a dream. You can say all you want that there are cheaper Wintel vendors, and you'll be right. Get the right tool for the right job. If Windows makes you happy, then by all means, head on over. But, the i9 MacBook Pro from the summer was right tool for macOS users, with the Vega 20 adding more for users. But like the model it supplants, it still may not be for everybody, and that's okay. You mean it is in in the GPU package, not the GPU die, correct? For the Cinebench results, can you compare CPU clocks while running the bench? It could also be an artifact of the silicon lottery. Ie, you got a CPU that runs a lilttle cooler at the same clock, and therefore can run a little higher clock for the same power draw. I'm about ready to plunk down my money for nearly this exact model MBP 15" (will use AppleInsiders Adorama deals as I did last year when I upgraded my iMac). But something is still bothering me and it is a test that AppleInsider did recently where they compared this model running MacOS vs Windows 10 in Bootcamp ( https://appleinsider.com/articles/18/11/22/benchmarked-amds-radeon-vega-20-gives-macbook-pro-big-graphics-boost ) and found that bootcamp resulted in superior frame rates. Could someone please explain how/why this would happen? It appears this is simply superior software on the part of Windows OS. But it could be that games/benchmarks are really optimized for OpenGL (which Apple has deprecated in favor of Metal), and the programs aren't yet optimized for Apple's new hardware. Which brings me to a bigger issue - in the past hardware specs combined with standardized benchmarking defined performance. Today with divergent hardware (companies are increasingly developing their own chip sets) and changing standards, benchmarking isn't correlating to my needs. I find the specialized software that I run isn't keeping up with the latest hardware, and in many cases may never be optimized for hardware configurations I end up purchasing. With unlimited funds I can always purchase a bigger hammer (faster hardware) and I will probably get a bump in program efficiency, but there is no way for me to do a cost/benefit ratio on this using today's tools. Or am I missing something? Fine with my 2016 15-inch Touch Bar. Zero problems with my keyboard, even after hours a day usage for two years. ARM-based MBPs will be here in 2020. Can't wait to kick Intel to the curb. On a per unit level, it was probably 10 machines per 1000. Something greater than 3 sigma, enough so that Apple instituted a repair program. AppleInsider was the only place that published some quantification of how many units could have been affected, and it was at best indirect. AI published repair incidents from a couple, maybe more (? 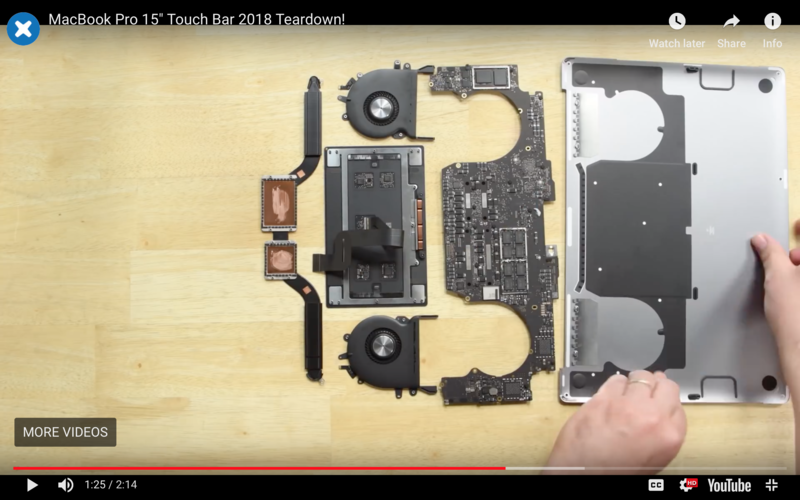 ), Apple stores, which stated that 2016 MBP had about 11% of total service repairs were keyboard repairs, about 2x the rate of 2015 MBP models, but in terms absolute numbers, it was about 50% more keyboard repairs, not 100% more. Ie, the 2016 MBP had less overall service repairs, but when one was repaired, keyboard repairs happened more often. Unfortunately, that is as far as it goes as nobody knows how many units go in repair per 1000 or per 1 million. But considering repair rates per units sold, it’ll have to be something like 10% of units sold, if not lower, and keyboard repairs were 10% of repairs. So, the vast majority of units didn’t have issues. This MBP w/Vega review included an unsubstantiated claim or intimation that the gen 3 keyboards have reliability issues. Best to ignore those kinds or article constructions until there is actual data. Another interesting find if you check it on iFixit, is that 15-inch MacBook Pro offers eight NAND Flash slots. 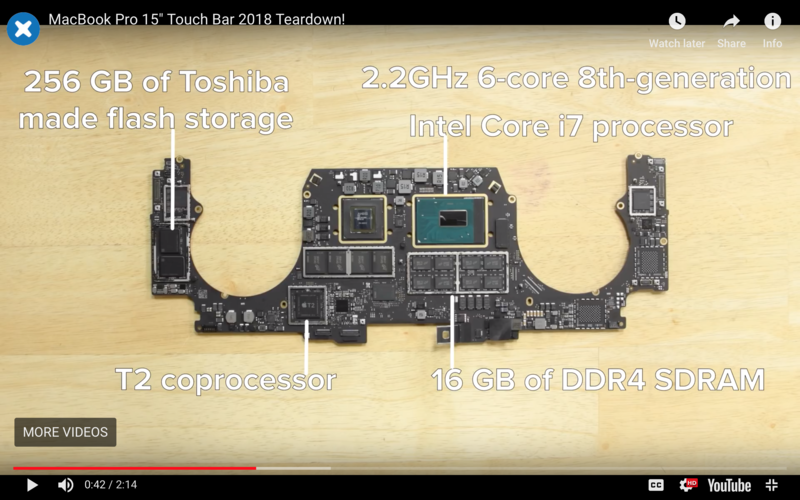 According to the infamous block diagram from iMac Pro, that T2 uses two x4 for communicating each Flash module, which also has eight NAND chips total. Unlike RAID 0 where two SSD are connected in series, T2 works more like a dual-channel memory that connects them in parallel. Also, looks like T2 technically is a chipset as well, so no need for an Intel PCH, one less bridge from NAND to the processor. So that means the 15" does have a lot of advantage compared to a single M.2 laptop and on par with two M.2 in RAID 0. But only 15" have that much, while 13" only have four, and two for the rest, most likely balancing from power/performance. You also have to choose more than 256GB if you want to fill up the sockets, maybe 512GB or 1T at least. Speaking of the RAM, however, I believe it's only single-channel since now a SO-DIMM is able to provide a 32GiB total. Now more thought: How would the bandwidth go on those machines? There's no worry on the iMac Pro since the CPU offers 40 PCI-E lanes (Intel PCH mostly for low-speed peripherical connections), nor on the 15" since it replaced the PCH. But can be a bit complicated for a U and Y-series since it has both CPU and PCH on the same package. Maybe that's another reason why they didn't include as much NAND chips as both of them (one x4 or even x2, compared to two x4). But something is still bothering me and it is a test that AppleInsider did recently where they compared this model running MacOS vs Windows 10 in Bootcamp ( https://appleinsider.com/articles/18/11/22/benchmarked-amds-radeon-vega-20-gives-macbook-pro-big-graphics-boost ) and found that bootcamp resulted in superior frame rates. It's more that games are optimizing for Windows platforms, and that Mac is an afterthought. Just as an example, I'm a fairly active League of Legends player. Windows players outnumber Mac players by something like 95 to 5 or more. But it takes exactly as much work for them to build a Metal compatible client as a DirectX client. Frankly, I think it's a blessing that we get games and ports at all. But yeah, they get the game out for Mac, that's awesome. When they have additional time for making it run better, you better believe that time gets spent where the users are. That's just on games, though. On pro apps, often Windows is better, but not always… IMO at the end of the day the app is being driven by a human being, not numbers, so you should work where you like to. Power saving LPDDR4 RAM is not available or possible? LPDDR4 RAM is supported by Intel’s mobile chips but is limited to the 16 GB. Not having 32 GB RAM was considered a misfeature in the 2016 and 2017 MBP15 models. So, available for up to 16 GB, but not possible for 32 GB. 32 GB LPDDR4 was or is slated for Intel 10nm Cannon Lake chips. Edit: So, I’m confused myself here. Current Intel chips support 16 GB LPDDR3 RAM. LPDDR4 RAM support is then slated for Cannon Lake. So, Intel chips currently do not support it. LPDDR4 RAM is available as they ship in smartphones and tablets, like iPhones and iPads. Impossible for now, RAM has always been a compromise for current design. I think those in the App Store were better optimized and truly fitted for the Mac, not always for third party programs. Some developers don’t even want to put effort on UI or gestures. I’m confused at what you are saying. There aren’t any NAND slots. The motherboard images show 16 RAM “slots”, 8 per side. It most certainly is using 2 channels of main memory, with 8 DRAM chips per channel. The NAND “card” looks like it is on the side of the board next to a TB3 controller. Apple offers a 4 GB NAND option, so maybe there is a second NAND card, 2 by 2 GB on the opposite side for that. Either that, or Apple is stacking NAND several layers deep since the NAND card looks like it is all of 30 mm long. I don’t think there is any argument that Apple has the fastest storage among laptops. I don’t think there are any NVMe cards that can achieve 3 GB/s read and writes. For PCIe lanes and the T2, there is a bit of mystery to it. The T2 laptop boards don’t seem to have an Intel PCH on them, and the CPUs only support 16 PCIe links. If there are only 16 PCIe links, then that means the GPU is only getting x8 PCIe lanes, and the x8 lanes are going to the T2, which not only support 3 GByte/s storage, it likely has to have a USB2 bus to support the camera, audio, keyboard, and trackpad. The TB3 controllers are multiplexed with the x8 dedicated to the GPU? Reading comprehension FTW? Look at that diagram you posted. The PCH is there. The T2 acts not as a PCH, but rather like (or inclusive of the functionality of) a Silicon Motion or Phison SSD controller. The T2 can't act as a PCH as it doesn't have a DMI interface, nor a whole bunch of other stuff. I expect that Apple could do that it if wanted to, except I doubt that Intel is willing to provide enough technical info to implement it. Also, the interfaces off a PCH are well-understood and independent of CPU generations, which may not be the case for DMI. Even if it is, they'd have to wait for specs when the generation changes, which would put them even further behind competitors who use Intel's PCH. So that means the 15" does have a lot of advantage compared to a single M.2 laptop and on par with two M.2 in RAID 0. Any advantage doesn't stem from more available bandwidth (they're both, in the end, limited to sharing a single DMI with everything else except video). It comes from a better controller, better flash management, etc. In fact, compared with a desktop system using a HEDT processor (or an AMD Zen), the desktop's flash RAID-0 will have a significant bandwidth advantage, since it will likely be coming off two x4 links directly on the processor itself, *not* the PCH. Also wrong. SO-DIMMs are irrelevant to the MBP, in which the RAM chips are soldered directly to the motherboard. 1. Every laptops AFAIK wires NAND to PCH instead CPU lanes, but RAID still makes a difference, because no single NAND SSD today maximize the bandwidth, so for the most time, two is still better than one. E.g. Thunderbolt 3 only uses x4, which is equal to 32Gb/s, yet Intel still sold a chip supporting two ports, so there’s still a difference in how to manage the bandwidth. 2. Check out pictures post above, not just the diagram. T2 appears can be work in both ways since no PCH can be found. iMac Pro works different because I assume they also need other connections, which T2 doesn’t offers in design. 3.https://www.overclockers.com/forums/showthread.php/148726-is-dual-ddr-like-raid-0 check out the last post. RAID 0 is not exactly really “hook in series”, but writes data like two devices in serial. T2 treats Flash memories like dual-channel RAMs (interleaved). 4. They’re soldered, but still a SO-DIMM (or SO-DIMM like) if you compared. Unless you check the system report and it does say 2x16GiB instead one 32GiB. Recently DDR4 just got bump in size, now two SODIMM can do 64GiB. See ThinkPad x1 Extreme. Same. Zero keyboard issues and I flat out abuse my mpb as a workhorse. Touchbar is fine with me. I didn’t care for it at first. But now I prefer it. No, because of Intel. To be able to go to 32 GB they had to switch to DDR4. I don't think that this is the laptop that Apple had originally planned to make at this time. with support for LPDDR4. (I think Apple is using LPDDR5 in the iPhone now). You would think that Intel would have tried making the switch to 12 nm at this point. I know its not as good as 10 nm but "A bird in the hand is worth two in the bush"
At least 12 nm would offer some power and space savings while they work out the 10 nm problems. Intel is having a lot of issues that better management (less aggressive 12 nm jump is just one of them), that is leading to ARM processors overall (especially Apple's) as well as AMD in a great potential to canabilize all that Intel has claimed. I'm buying this exact machine except with 2TB this week! Very excited as my 2011 MBP's dGPU finally died its final death, and currently using a loaner 2013 11" Air with an i3 and 4GB of RAM. So this will be a nice bump up from that. You guys are so lucky! The keyboard on my 2016 is really driving home the importance of proof-reading. So many keys have randomly gone sideways on this thing it's sucking the joy out of the purchase. Today it's B and 7. I haven't bothered reporting or taking it to Apple, because it's faster to smack the schmutz out of it myself than keep trotting off to the Apple Store (especially when Genius Bar appointments are booking more than a week out). However, if you guys aren't having any trouble with yours, it makes me wonder if the difference is circumstances or production lot? Maybe mine came from a bad batch. If that's the case, maybe replacing it will solve my woes. Any idea how I might persuade the person at the Genius Bar to actually replace my keyboard instead of blasting it with a can of air and sending me on my way? It's nice that the Vega 20 is available on the MBP for consistency purposes but even the tests show a comparably modest increase in performance. The 560x produces 2.1-2.4 TF of performance. The Vega 20 is a 3.1-3.4 part. That's not even a theoretical 50% increase in performance. And 3.4 TF is hardly enough to do any serious lifting. For some perspective, the card that is in the newest "cutting edge" MBP today trades with the 295X, which debuted in the iMac...almost 4.5 years ago. it's outperformed by a GTX 980m, which has been out for years. Heck, it's not appreciably faster to the 3 TF 880m that was prevalent in 2014(which in turn was only mildly quicker than the 2013 iMac 780m). Don't get me wrong. It's nice they added it. It certainly helps. But when the fastest laptop GPU you can get at Apple doesn't even perform like a 2015 GTX 970...you have a bit of a let down coming, imo.